The director of Nick Cave documentary One More Time With Feeling has explained why Cave decided to make a film documenting the making of his upcoming album Skeleton Tree. Andrew Dominik reports Cave wanted to make the film so he wouldn’t have to face the media while promoting the record – as he wanted to avoid talking about the death of his son Arthur. The 15-year-old died after he fell from a cliff in Brighton earlier this year. The inquest into his death revealed the teenager had taken LSD for the first time before the accident. Speaking at the documentary’s premiere at the Venice Film Festival, Dominik says (via the Guardian): “Nick went into a newsagent in Brighton and saw a copy of Mojo – he realised he was going to have to promote the record. “Arthur had died halfway through making it and the idea of promoting it made him feel sick, because he was going to have to discuss the context of the record with a whole bunch of journalists. 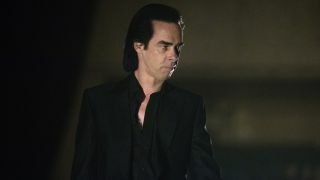 Last week, Nick Cave & The Bad Seeds released a video for the track Jesus Alone, which featured footage from the film. Skeleton Tree will be released on September 9 and is available for pre-order, with those purchasing ahead of its official release getting instant access to Jesus Alone.